Teaching at Rancho La Puerta is always full of surprises. The guests who sign up for my classes are a diverse group of extremely accomplished people from all walks of life. But in the kitchen, we’re all equals, because in the time we have together there is one aim: to cook a menu of seven recipes in two hours and to sit and enjoy the meal together. Cooking is all about the pleasures of the table and the sense of community it fosters. 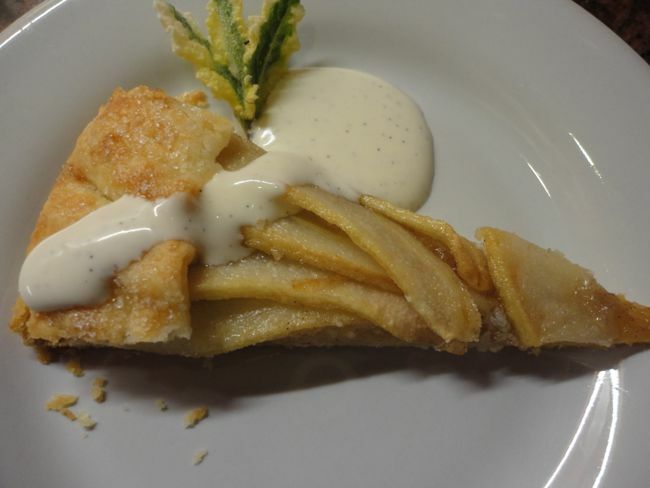 At my first class, Dana Shaltry, a pediatric orthodontist, volunteered to make the dessert, a rustic French pear galette. I had demonstrated how to make the ground almond bases and pastry with a food processor, and Dana took it from there. He rolled the dough into a rough circle, cut the pears into thin slices, and arranged the fruit beautifully over the ground almonds. Once the fruit is arranged, he sprinkled on some sugar, scattered dots of butter on top, and folded the sides of the dough around the pears, pressing firmly to adhere. After baking, we served wedges of the galette with a spoonful of creme fraiche. Pear and Almond GaletteYou’ll need a 14-inch pizza pan or large rimmed baking sheet for baking the galette. 1. To make the pastry, combine the flour and salt in a medium bowl. Slice the cold butter and add to the bowl. Use a pastry blender to cut the butter into smaller pieces, about ½ inch or so. Then reach into the bowl, and with your fingertips, rapidly press and flatten the butter pieces into flakes. Work quickly so the butter doesn’t soften and don’t be concerned about flattening every piece of butter. Add the ice water 1 tablespoon at a time, and stir and toss with a fork to combine. Stir just until the dough comes together in one mass. If the dough seems dry, add only enough additional water to make it cohere. Shape the dough into a ¾-inch-thick disc—you’ll see large flakes of butter in the dough—and enclose with plastic wrap. Refrigerate for at least 1 hour to firm the dough. 2. To make the ground almond base, process the almonds, flour, sugar, and cinnamon with a food processor for a few seconds until the nuts are finely ground. 3. If you have a baking stone, set it on the center shelf of your oven and preheat the oven to 400 degrees. If you don’t have a baking stone, just preheat the oven to 400 degrees. 4. To shape the galette, roll the chilled pastry on a lightly floured surface into a very thin, roughly shaped circle, 14 inches in diameter. If the dough is very firm, let it sit at room temperature about 10 minutes or tap the pastry all over with the rolling pin to flatten it a bit, then roll it out. You may not think the dough will be able to become 14 inches in diameter, but it will. (If the dough feels too soft, fold it in half, transfer it to the pizza pan or rimmed baking sheet, unfold it, and refrigerate a few minutes.) Do not be concerned about rough edges of dough or if your circle is perfect. This is rustic. What’s important is that the dough is thin, thin, thin. The butter flakes melt during baking and the pockets of air that are formed make the pastry flaky. 5. Transfer the dough to the pizza pan or rimmed baking sheet. Sprinkle the ground almonds and flour onto the center of the dough and distribute with your fingers into a thin powdery circle about 11-inches in diameter. 6. Peel, quarter and core the pears. Slice each quarter lengthwise into 5 thin wedges. 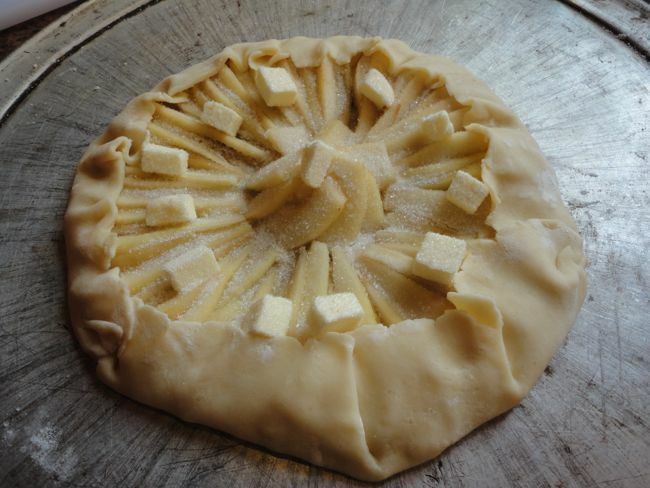 Arrange all but 6 of the pear wedges on the dough in a spoke pattern, overlapping them slightly. 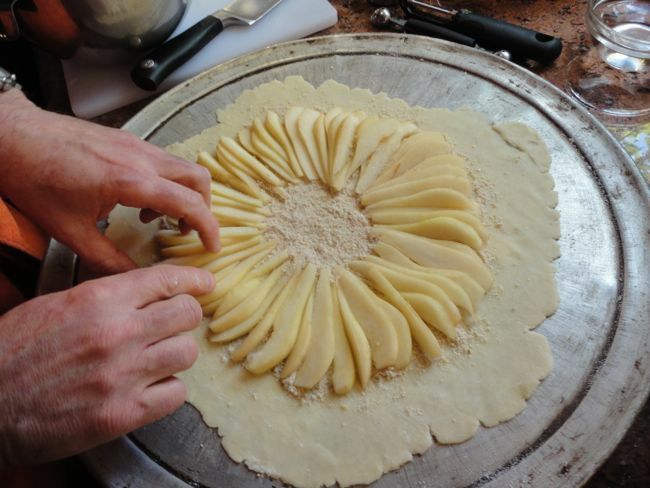 Cut the remaining pear wedges and arrange them in the center of the tart to form a decorative rose. Dot the pear slices with the pieces of butter and sprinkle with 3 tablespoons of the sugar. Bring up edges of the pastry to cover the outer edge of pears and press gently to adhere. Brush the pastry with water and sprinkle with the remaining 1 tablespoon sugar. 7. 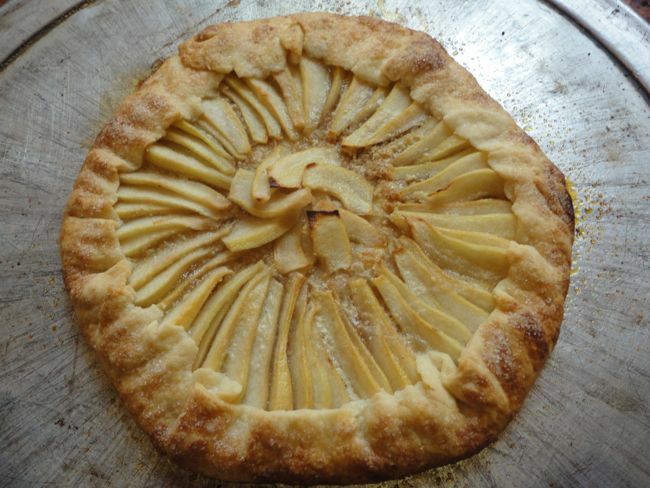 Put the galette into the oven and bake for 45 to 50 minutes, or maybe even longer, until the pear juices bubble thickly, like a syrup, and the pastry is well-browned with random darker spots. The sugar must be well caramelized. 8. Cool the galette on its pan for 10 to 15 minutes, then transfer with a wide metal spatula to a wire cooling rack. Sometimes juices leak onto the pan during baking causing the galette to stick, so loosen the galette carefully to avoid tearing the pastry. The galette is best when very fresh. Serve it plain. It needs nothing extra.